You'll find here information about decor monogram letters for wall or door, to give your interior an extra personal touch. You can choose from several materials such as vinyl, wood, metal to form letters and monograms supplied by companies such as 48 Hour Monogram, MPI Wood, UnfinishedWoodCo, Wooden Numbers, Mr & Mrs Wooden Letters, Hanging Wall Letters, Rusty Metal Letters, Evergreen Monogram Letter Door Hanger, Cast Iron Letters (w/ wall hook), Laser Lizard, Newsee Decals. Whether you're looking for letters or monograms for doors, walls, bedrooms, baby rooms, kids rooms, guest room, living, study, den, rest rooms, there's information about these products, such as personalized name wall decals, further on. If you want big wooden letters, but you're not sure what size to choose, know that 24 inch wooden letters are by far the most popular ones and 36 inch wooden letters are usually the largest. Images below may lead to Amazon where you can read through the reviews which is quite informative. - Choice in tall sizes (inches): 12, 16, 20, 24, 30, 32, 36. - You can enter the three monogram letters you want. - Material: 1/2 inch thick Baltic Birch wood. - It is ready to paint. - This company ships out orders in two days (24 hours). - If you want it painted, then count another 3 business days. - You can choose the paint colors: Rose Gold, White or Black. See Amazon here for the large 3-Letters Monogram in unfinished wood. - These wall decor letters are lower case. All alphabet letters available. - Hand painted in White. If you want a different color, just paint or spray it - no need to use sandpaper. - These decorative wooden letters are also often used as baby name wall art. Rating: Great. Price indic. : $10. See Amazon here for the wooden hanging wall letters. - Size: 13'' tall X approx. 9'' wide. See Amazon for the MPI wooden Letters and Numbers. - Size: from 13'' to approx. 23" tall. Price indic. : $13 to $30. 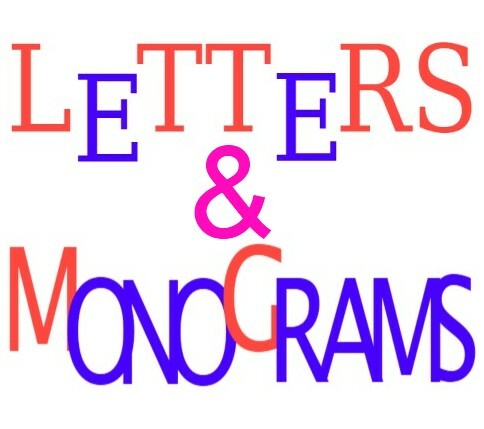 See Amazon here for the wooden Letters and Monogram Letters. These wooden numbers come unfinished and are quite suitable when you want your house number really visible. See Amazon here for the 8 inch wooden letters. You can choose from the letters A to Z, made of tin or burlap. Rating: Great. Price indic. : $15. See Amazon here for the Metal and Burlap Letters. Wooden letters in brown color, to display initials or names. These letters can stand alone or to hang on wall with back slot. See Amazon here for the 6 inch tall letters. White wood letters, 4 inches tall. Quite suitable for decorating your parties, but also for your home. Comes in 3 pieces: Mr & Mrs. Rating: Great. Price indic. : $11. See Amazon here for the MR & MRS Wooden Letters. Tall: 20.7 or 28 inches, 3/4 inch MDF wood. Rating: Great. Price indic. : $34. See Amazon here for the MR & MRS Wooden Letters VINTAGE Rose Gold Glitter. - Size: 7 1/2 x 3 x 1 3/4 inches. See Amazon here for the Cast Iron Wall Hook Monogram Letters. - Material: corrugated metal tin roofing from old barns. Approx. 1.5" thick..
- Unique characteristic letters which may contain nail holes, rips, rust spots, weathering or other imperfections. 6, 8, 10, 12, 16, 20, 24, 30, 36. There's an optie to enter the letters and/or numbers, and if you want a wire hanger attached to the back of the letter. Size 36" is too heavy for a wire hanger. You can also add your finish preference or a note if you want. Rating: Great. Price indic. : from $10 and up (depends on size). See Amazon for the Rusty Tin Metal Letters. - Size: 17.5'' tall X 28'' wide - laser cut. - Material: 1/4 inch thick Baltic Birch 5 ply plywood. - It is ready to paint, but of course, you can also leave it natural. See Amazon here for the Laser Lizard 3 Letter Monogram in unfinished wood. With the evergreen classic monogram letter door hanger you have a very nice and stylish decor. It is made of a blend of poly-felt and poly-burlap fabrics, featuring detailed silk stitching and your initial. Its size is 17 x 21 inches, hangs from a black grosgrain ribbon, and is quite suitable for outdoors, and weighs about 0.28 lbs. You can choose from all letters of the alphabet. To hang it on your front door, be sure that it is not too windy there, as it is a lightweight object. See Amazon here for the Evergreen Classic Monogram Letter Burlap Door Hanger. Click there on the letter of your choice. - Decal size: approx. 13 x 24 inches (height x width)..
- After your purchase at Amazon, where you'll then see the "Contact Seller" option, you can send an email about your monogram letters and color choice. See Amazon here for the Name and Initial Wall Decal.